after over 2 years on inactivity due to extreme laziness, I started (with the help of my girlfriend Ming, to get back to this.
. our English has gone down as we dumb it down every single day in our job (ESL teachers). Axel, from Italy, mixed French, born in 1987. Italy, France and England. Most importantly, in Asia, in: Vietnam, HongKong and mainland China (Guangdong, Sichuan and now Guangxi). Then I have also traveled to other places. The story is long, I’ll try to make it short. it starts with a movie I watched with some friends: Sorcerer. In this ’77 film, at a certain point, a certain character, named Serrano, has to drive his truck on a dilapidated rope-suspension bridge. 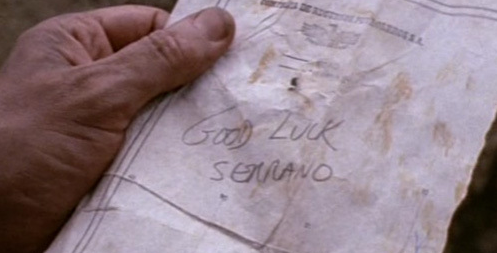 His “colleague” who just passed it left him a note at the entrance of the bridge “Good Luck Serrano“. Later in time, a friend of mine gave a leaving gift (yes, I was leaving again as I did many times now), he told me to open the gift only when I would feel I am in a unforgiving situation. That friend also created one of the bloodiest and craziest videogames ever, but that’s another story. Once I found myself in such a situation I opened the gift. It contained a note “Good Luck Serrano” and nothing else. In the past years I found myself in such weird situations more than once and that message, along with the aura of that movie it brings, just fits. End. I also like the way it sounds. Real End. What do you do in Asia? The question should be what I don’t do and the answer would be “getting too bored”. In terms of jobs I’ve been an English Teacher, I worked in the cufflinks industry (unbelievable huh? ), wine industry and I am now back to teaching. I also sporadically write for some magazines. I like sharing, helping others with same fears and hopes, keeping a diary and I don’t like repeating the same things to all my friends when I come back to Italy. However, this blog is in English, I am screwed.